Two days ago the European Organization for Nuclear Research (CERN) announced some data they actually gathered in December of last year. They found a new subatomic particle, and they think they might at last have the Higgs boson. The news has excited most laypeople and many scientists. But no one seems able to say what the Higgs boson is, or what finding it really means. We observe in our data clear signs of a new particle, at the level of 5 sigma, in the mass region around 126 GeV. “Five sigma,” in statistics, is almost an ironclad guarantee. Scientists describe subatomic particles, not by their weight, but by their energy; hence “126 GeV.” That makes it 126 times as heavy as a proton, and the heaviest subatomic particle anyone has found so far. 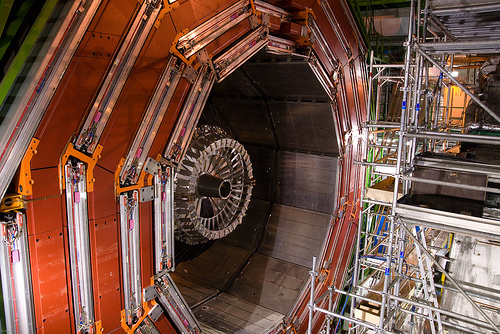 The data come from two sets of experiments on the Large Hadron Collider, the largest atom-smasher in the world. The names of those experiments are ATLAS and CMS (Compact Muon Solenoid). A section of the Large Hadron Collider. Photo: User “solarnu” (Flickr.com); Creative Commons Attribution/Non-Derivative 2.0 Generic License. The problem: one type of particle is missing. That particle is the Higgs boson. The W and Z bosons cannot exist without it. For that matter, neither can anything else. The Higgs boson, according to this theory, is the source of mass. Just one catch: the Standard Model says nothing about dark matter, or about canceling out the mass of the Higgs boson, or what that would do to the larger object. The Los Angeles Times talked about US scientists being jealous of CERN. Why? Because CERN has the LHC, and Congress refused to build the Texas Superconducting Super-Collider. The Daily Telegraph (London) interviewed Peter Higgs, who said forty years ago that such a particle must exist. Now that CERN has found it (maybe), even he admits: he has no idea what it’s for, or how to use it. At least he’s honest. In fact, nothing in particle physics says, or implies, that without the Higgs boson, the Big Bang could not happen. Then again, nothing says that it could happen. This is another heavy particle, nothing more. And no matter what anyone says, the Higgs boson cannot prove anything about how the universe came about. No one can prove anything in science. One can only disprove something. CERN has shown one thing only: the Standard Model still holds. So far. The US government is actually spending billions upon billions of dollars looking for extraterrestrial life forms, and why? Because they think that the discovery of a virus on Mars will prove that man is not special and there is no God. There must be a cheaper way, some deity-destroying pill we could all take. I feel sure there is government money for such a program. My biologist friends use to tell me that there is no mystery about how life originated on earth. After all, given infinite time and an infinite variety of circumstances,anything can happen. This is an insincere argument, since it is precisely the scientists who have limited both the time and the circumstances in which life might have originated. Nobel laureate Francis Crick was honest enough to see the thing was impossible, which is why he put forward the hypothesis that life is alien on earth, having arrived by way of spores from outer space. This conveniently gets us back to infinite time and circumstances, but it is really a confession of failure. To which, no doubt, Blake would add the Higgs boson. This entry was posted in News by Terry Hurlbut. Bookmark the permalink.